Human interactions with microbes include both practical and symbolic uses of microbes, and negative interactions in the form of human, domestic animal, and crop diseases. 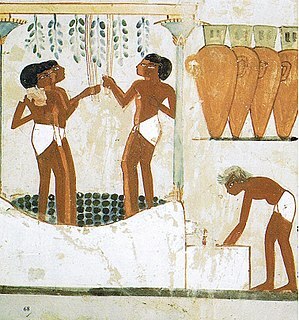 Practical use of microbes began in ancient times with fermentation in food processing; bread, beer and wine have been produced by yeasts from the dawn of civilisation, such as in ancient Egypt. More recently, microbes have been used in activities from biological warfare to the production of chemicals by fermentation, as industrial chemists discover how to manufacture a widening variety of organic chemicals including enzymes and bioactive molecules such as hormones and competitive inhibitors for use as medicines. 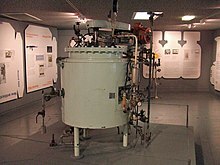 Fermentation is used, too, to produce substitutes for fossil fuels in forms such as ethanol and methane; fuels may also be produced by algae. Anaerobic microorganisms are important in sewage treatment. In scientific research, yeasts and the bacterium Escherichia coli serve as model organisms especially in genetics and related fields. On the symbolic side, an early poem about brewing is the Sumerian "Hymn to Ninkasi", from 1800 BC. In the Middle Ages, Giovanni Boccaccio's The Decameron and Geoffrey Chaucer's The Canterbury Tales: addressed people's fear of deadly contagion and the moral decline that could result. Novelists have exploited the apocalyptic possibilities of pandemics from Mary Shelley's 1826 The Last Man and Jack London's 1912 The Scarlet Plague onwards. Hilaire Belloc wrote a humorous poem to "The Microbe" in 1912. Dramatic plagues and mass infection have formed the story lines of many Hollywood films, starting with Nosferatu in 1922. In 1971, The Andromeda Strain told the tale of an extraterrestrial microbe threatening life on Earth. Microbiologists since Alexander Fleming have used coloured or fluorescing colonies of bacteria to create miniature artworks. Microorganisms such as bacteria and viruses are important as pathogens, causing disease to humans, crop plants, and domestic animals. Culture consists of the social behaviour and norms found in human societies and transmitted through social learning. Cultural universals in all human societies include expressive forms like art, music, dance, ritual, religion, and technologies like tool usage, cooking, shelter, and clothing. The concept of material culture covers physical expressions such as technology, architecture and art, whereas immaterial culture includes principles of social organization, mythology, philosophy, literature, and science. This article describes the roles played by microorganisms in human culture. 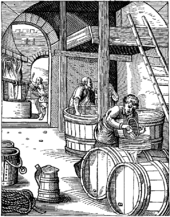 Since microbes were not known until the Early Modern period, they appear in earlier literature indirectly, through descriptions of baking and brewing. Only with the invention of the microscope, as used by Robert Hooke in his 1665 book Micrographia, and by Antonie Van Leeuwenhoek in the 1670s, the germ theory of disease, and progress in microbiology in the 19th century were microbes observed directly, identified as living organisms, and put to use on a scientific basis. The same knowledge also allowed microbes to appear explicitly in literature and the arts. Controlled fermentation with microbes in brewing, wine making, baking, pickling and cultured dairy products such as yogurt and cheese, is used to modify ingredients to make foods with desirable properties. The principal microbes involved are yeasts, in the case of beer, wine, and ordinary bread; and bacteria, in the case of anaerobically fermented vegetables, dairy products, and sourdough bread. The cultures variously provide flavour and aroma, inhibit pathogens, increase digestibility and palatability, make bread rise, reduce cooking time, and create useful products including alcohol, organic acids, vitamins, amino acids, and carbon dioxide. Safety is maintained with the help of food microbiology. Oxidative sewage treatment processes rely on microorganisms to oxidise organic constituents. Anaerobic microorganisms reduce sludge solids producing methane gas and a sterile mineralised residue. In potable water treatment, one method, the slow sand filter, employs a complex gelatinous layer composed of a wide range of microorganisms to remove both dissolved and particulate material from raw water. Microorganisms are used in fermentation to produce ethanol, and in biogas reactors to produce methane. Scientists are researching the use of algae to produce liquid fuels, and bacteria to convert various forms of agricultural and urban waste into usable fuels. Microorganisms are used for many commercial and industrial purposes, including the production of chemicals, enzymes and other bioactive molecules, often through protein engineering. For example, acetic acid is produced by the bacterium Acetobacter aceti, while citric acid is produced by the fungus Aspergillus niger. Microorganisms are used to prepare a widening range of bioactive molecules and enzymes. For example, Streptokinase produced by the bacterium Streptococcus and modified by genetic engineering is used to remove clots from the blood vessels of patients who have suffered a heart attack. Cyclosporin A is an immunosuppressive agent in organ transplantation, while statins produced by the yeast Monascus purpureus serve as blood cholesterol lowering agents, competitively inhibiting the enzyme that synthesizes cholesterol. Microorganisms are essential tools in biotechnology, biochemistry, genetics, and molecular biology. The yeasts brewer's yeast (Saccharomyces cerevisiae) and fission yeast (Schizosaccharomyces pombe) are important model organisms in science, since they are simple eukaryotes that can be grown rapidly in large numbers and are easily manipulated. They are particularly valuable in genetics, genomics and proteomics, for example in protein production. The easily cultured gut bacterium Escherichia coli, a prokaryote, is similarly widely used as a model organism. Microbes can form an endosymbiotic relationship with larger organisms. For example, the bacteria that live within the human digestive system contribute to human health through gut immunity, the synthesis of vitamins such as folic acid and biotin, and the fermentation of complex indigestible carbohydrates. Future drugs and food chemicals may need to be tested on the gut microbiota; it is already clear that probiotic supplements can promote health, and that gut microbes are affected by both diet and medicines. Pathogenic microbes, and toxins that they produce, have been developed as possible agents of warfare. Crude forms of biological warfare have been practiced since antiquity. In the 6th century BC, the Assyrians poisoned enemy wells with a fungus said to render the enemy delirious. In 1346, the bodies of Mongol warriors of the Golden Horde who had died of plague were thrown over the walls of the besieged Crimean city of Kaffa, possibly assisting the spread of the Black Death into Europe. Advances in bacteriology in the 20th century increased the sophistication of possible bio-agents in war. Biological sabotage—in the form of anthrax and glanders—was undertaken on behalf of the Imperial German government during World War I, with indifferent results. In World War II, Britain weaponised tularemia, anthrax, brucellosis, and botulism toxins, but never used them. The USA similarly explored biological warfare agents, developing anthrax spores, brucellosis, and botulism toxins for possible military use. 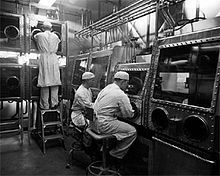 Japan developed biological warfare agents, with the use of experiments on human prisoners, and was about to use them when the war ended. Being very small, and unknown until the invention of the microscope, microbes do not feature directly in art or literature before Early Modern times (though they appear indirectly in works about brewing and baking), when Antonie van Leeuwenhoek observed microbes in water in 1676; his results were soon confirmed by Robert Hooke. A few major diseases such as tuberculosis appear in literature, art, film, opera and music. The literary possibilities of post-apocalyptic stories about pandemics (worldwide outbreaks of disease) have been explored in novels and films from Mary Shelley's 1826 The Last Man and Jack London's 1912 The Scarlet Plague onwards. Medieval writings that deal with plague include Giovanni Boccaccio's The Decameron and Geoffrey Chaucer's The Canterbury Tales: both treat the people's fear of contagion and the resulting moral decline, as well as bodily death. The making of beer has been celebrated in verse since the time of Ancient Sumeria, c. 1800 BC, when the "Hymn to Ninkasi" was inscribed on a clay tablet. Ninkasi, tutelary goddess of beer, and daughter of the creator Enki and the "queen of the sacred lake" Ninki, "handles the dough and with a big shovel, mixing in a pit, the bappir with [date] honey, ... waters the malt set on the ground, ... soaks the malt in a jar, ... spreads the cooked mash on large reed mats, coolness overcomes, ... holds with both hands the great sweet wort, brewing it with honey". Wine is a frequent topic in English literature, from the spiced French and Italian "ypocras", "claree", and "vernage" in Chaucer's The Merchant's Tale onwards. William Shakespeare's Falstaff drank Spanish "sherris sack", in contrast to Sir Toby Belch's preference for "canary". Wine references in later centuries branch out to more winegrowing regions. The Microbe is a humorous 1912 poem by Hilaire Belloc, starting with the lines "The microbe is so very small / You cannot make him out at all,/ But many sanguine people hope / To see him through a microscope. Microbes and Man is an admired "classic" book, first published in 1969, by the "father figure of British microbiology" John Postgate on the whole subject of microorganisms and their relationships with humans. Microbes feature in many highly dramatized films. Hollywood was quick to exploit the possibilities of deadly disease, mass infection and drastic government reaction, starting as early as 1922 with Nosferatu, in which a Dracula-like figure, Count Orlok, sleeps in unhallowed ground contaminated with the Black Death, which he brings with him wherever he goes. Another classic film, Ingmar Bergman's 1957 The Seventh Seal, deals with the plague theme very differently, with the grim reaper directly represented by an actor in a hood. More recently, the 1971 The Andromeda Strain, based on a novel by Michael Crichton, portrayed an extraterrestrial microbe contaminating the Earth. "A Very Cellular Song," a song from the British psychedelic folk band The Incredible String Band's 1968 album The Hangman's Beautiful Daughter, is told partially from the point of view of an amoeba, a protistan. Microbial art is the creation of artworks by culturing bacteria, typically on agar plates, to form desired patterns. These may be chosen to fluoresce under ultraviolet light in different colours. Alexander Fleming, the discoverer of penicillin, created "germ paintings" using different species of bacteria that were naturally pigmented in different colours. An instance of a protist in an artwork is the artist Louise Bourgeois's bronze sculpture Amoeba. It has a white patina resembling plaster, and was designed in 1963–5, based on drawings of a pregnant woman's belly that she made as early as the 1940s. According to the Tate Gallery, the work "is a roughly modelled organic form, its bulges and single opening suggesting a moving, living creature in the stages of evolution." The Soviet Union 1966 stamp for the Microbiology International Congress. Bacteria and viruses form the background. Microorganisms are the causative agents (pathogens) in many infectious diseases of humans and domestic animals. Pathogenic bacteria cause diseases such as plague, tuberculosis and anthrax. Protozoa cause diseases including malaria, sleeping sickness, dysentery and toxoplasmosis. Microscopic fungi cause diseases such as ringworm, candidiasis and histoplasmosis. Pathogenic viruses cause diseases such as influenza, yellow fever and AIDS. 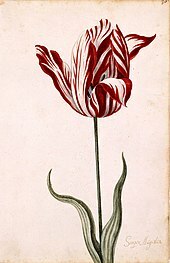 Semper Augustus Tulip, 17th century, owed its pattern to a virus. The practice of hygiene was created to prevent infection or food spoiling by eliminating microbes, especially bacteria, from the surroundings. Microorganisms including bacteria, fungi, and viruses are important as plant pathogens, causing disease to crop plants. Fungi cause serious crop diseases such as maize leaf rust, wheat stem rust, and powdery mildew. Bacteria cause plant diseases including leaf spot and crown galls. Viruses cause plant diseases such as leaf mosaic. The oomycete Phytophthora infestans causes potato blight, contributing to the Great Irish Famine of the 1840s. The tulip breaking virus played a role in the tulip mania of the Dutch Golden Age. The famous Semper Augustus tulip, in particular, owed its striking pattern to infection with the plant disease, a kind of mosaic virus, making it the most expensive of all the tulip bulbs sold. ^ Macionis, John J.; Gerber, Linda Marie (2011). Sociology. Pearson Prentice Hall. p. 53. ISBN 978-0137001613. OCLC 652430995. ^ Hooke, Robert (1665). Micrographia: Or Some Physiological Descriptions of Minute Bodies Made by Magnifying Glasses, with Observations and Inquiries Thereupon. Courier Dover. ISBN 978-0-486-49564-4. Retrieved 22 July 2014. ^ Payne, A.S. (1970). The Cleere Observer: A Biography of Antoni Van Leeuwenhoek. Macmillan. p. 13. ^ "Germ Theory". Rank. Retrieved 27 September 2016. ^ "Menagerie of Microbes". Ascus. Archived from the original on 27 September 2016. Retrieved 27 September 2016. ^ "Dairy Microbiology". University of Guelph. Retrieved 9 October 2006. ^ Steinkraus, K. H., ed. (1995). Handbook of Indigenous Fermented Foods. Marcel Dekker. ^ Hui, Y. H.; Meunier-Goddik, Lisbeth; Josephsen, Jytte; Nip, Wai-Kit; Stanfield, Peggy S. (2004). Handbook of Food and Beverage Fermentation Technology. CRC Press. pp. 27 and passim. ISBN 978-0-8247-5122-7. ^ Gray, N.F. (2004). Biology of Wastewater Treatment. Imperial College Press. p. 1164. ISBN 978-1-86094-332-4. ^ Kitani, Osumu; Carl W. Hall (1989). Biomass Handbook. Taylor & Francis US. p. 256. ISBN 978-2-88124-269-4. ^ Pimental, David (2007). Food, Energy, and Society. CRC Press. p. 289. ISBN 978-1-4200-4667-0. ^ Tickell, Joshua; et al. (2000). From the Fryer to the Fuel Tank: The Complete Guide to Using Vegetable Oil as an Alternative Fuel. Biodiesel America. p. 53. ISBN 978-0-9707227-0-6. ^ Inslee, Jay; et al. (2008). Apollo's Fire: Igniting America's Clean Energy Economy. Island Press. p. 157. ISBN 978-1-59726-175-3. ^ Biology textbook for class XII. National council of educational research and training. 2006. p. 183. ISBN 978-81-7450-639-9. ^ Castrillo J.I. ; Oliver S. G. (2004). "Yeast as a touchstone in post-genomic research: strategies for integrative analysis in functional genomics". J. Biochem. Mol. Biol. 37 (1): 93–106. doi:10.5483/BMBRep.2004.37.1.093. PMID 14761307. Archived from the original on 2008-06-15. ^ Sunnerhagen, P. (2002). "Prospects for functional genomics in Schizosaccharomyces pombe". Curr. Genet. 42 (2): 73–84. doi:10.1007/s00294-002-0335-6. PMID 12478386. ^ Soni, S. K. (2007). Microbes: A Source of Energy for 21st Century. New India Publishing. ISBN 978-81-89422-14-1. ^ Moses, Vivian; et al. (1999). Biotechnology: The Science and the Business. CRC Press. p. 563. ISBN 978-90-5702-407-8. ^ Lee, S. Y. (March 1996). "High cell-density culture of Escherichia coli". Trends in Biotechnology. 14 (3): 98–105. doi:10.1016/0167-7799(96)80930-9. PMID 8867291. ^ O'Hara, A.; Shanahan, F. (2006). "The gut flora as a forgotten organ". EMBO Rep. 7 (7): 688–93. doi:10.1038/sj.embor.7400731. PMC 1500832. PMID 16819463. ^ Valdes, Ana M; Walter, Jens; Segal, Eran; Spector, Tim D (2018). "Role of the gut microbiota in nutrition and health". BMJ: k2179. doi:10.1136/bmj.k2179. ^ Wheelis, Mark; Rózsa, Lajos; Dando, Malcolm (2006). Deadly Cultures: Biological Weapons Since 1945. Harvard University Press. ISBN 978-0-674-01699-6. ^ Mayor, Adrienne (2003). Greek Fire, Poison Arrows & Scorpion Bombs: Biological and Chemical Warfare in the Ancient World. Woodstock, N.Y.: Overlook Duckworth. ISBN 978-1-58567-348-3. ^ Wheelis, Mark (2002). "Biological warfare at the 1346 siege of Caffa". Emerg Infect Dis. Center for Disease Control. 8 (9): 971–5. doi:10.3201/eid0809.010536. PMC 2732530. PMID 12194776. ^ Barras, Vincent; Greub, Gilbert (2014). "History of biological warfare and bioterrorism". Clinical Microbiology and Infection. 20 (6): 497–502. doi:10.1111/1469-0691.12706. PMID 24894605. ^ Andrew G. Robertson, and Laura J. Robertson. "From asps to allegations: biological warfare in history," Military medicine (1995) 160#8 pp: 369–373. ^ Koenig, Robert (2006), The Fourth Horseman: One Man's Secret Campaign to Fight the Great War in America, PublicAffairs. ^ Prasad, S.K. (2009). Biological Agents, Volume 2. Discovery Publishing House. p. 36. ISBN 978-81-8356-381-9. ^ Covert, Norman M. (2000), "A History of Fort Detrick, Maryland", 4th Edition: 2000. ^ Guillemi n, J. (2006). "Scientists and the history of biological weapons: A brief historical overview of the development of biological weapons in the twentieth century". EMBO Reports. 7 (Spec No): S45–S49. doi:10.1038/sj.embor.7400689. PMC 1490304. PMID 16819450. ^ Williams, Peter; Wallace, David (1989). Unit 731: Japan's Secret Biological Warfare in World War II. Free Press. ISBN 978-0-02-935301-1. ^ "Weapons of Mass Destruction: Plague as Biological Weapons Agent". GlobalSecurity.org. Retrieved 21 December 2014. ^ Amy Stewart (25 April 2011). "Where To Find The World's Most 'Wicked Bugs': Fleas". National Public Radio. ^ Russell Working (5 June 2001). "The trial of Unit 731". The Japan Times. ^ "Antonie van Leeuwenhoek (1632–1723)". BBC. 2014. Retrieved 29 June 2016. ^ "Pulmonary Tuberculosis/In Literature and Art". McMaster University History of Diseases. Retrieved 9 June 2017. ^ Riva, Michele Augusto; Benedetti, Marta; Cesana, Giancarlo (October 2014). "Pandemic Fear and Literature: Observations from Jack London's 'The Scarlet Plague' [another dimension]". Emerging Infectious Diseases. 20 (10): online. doi:10.3201/eid2010.130278. ^ "Discover the Oldest Beer Recipe in History From Ancient Sumeria, 1800 B.C." Open Culture. 3 March 2015. Retrieved 29 June 2016. ^ Harding, Julia (2015). The Oxford Companion to Wine. Oxford University Press. pp. 261–263. ISBN 978-0-19-870538-3. ^ Belloc, Hilaire (1912). The Microbe. More Beasts for Worse Children. Duckworth. Retrieved 29 June 2016. ^ Hogg, Stuart (2013). Essential Microbiology. John Wiley & Sons. p. 497. ISBN 978-1-118-68814-4. ^ Cole, J. A. (2012). "Legless pathogens: how bacterial physiology provides the key to understanding pathogenicity". Microbiology. 158 (Pt 6): 1402–1413. doi:10.1099/mic.0.059048-0. PMID 22493300. ^ Postgate, John (2000). Microbes and Man (4th ed.). ISBN 978-0-521-66579-7. ^ Wald, Priscilla (2008). Contagious: Cultures, Carriers, and the Outbreak Narrative. Duke University Press. pp. 31–. ISBN 978-0-8223-4153-6. ^ a b Hsu, Jeremy (9 September 2011). "Germs on the Big Screen: 11 Infectious Movies". Live Science. Retrieved 29 June 2016. ^ "A Very Cellular Song Lyrics". Metro Lyrics. Retrieved 29 June 2016. ^ Torrice, Michael, ed. (6 November 2009). "Petri Dish Artists" (pdf). Science. AAAS. 326 (5954): 777. doi:10.1126/science.326_777b. Retrieved 17 April 2018. ^ Dunn, Rob (11 July 2010). "Painting With Penicillin: Alexander Fleming's Germ Art". Smithsonian Institution. ^ "Louise Bourgeois. Amoeba 1963–5, cast 1984". Tate Gallery. Retrieved 29 June 2016. ^ Alberts, B.; Johnson, A.; Lewis, J. (2002). "Introduction to Pathogens". Molecular Biology of the Cell (4th ed.). Garland Science. p. 1. ^ "MetaPathogen". Retrieved 15 January 2015. ^ "Hygiene". Retrieved 29 June 2016. ^ Burkholder (October 1948). "Bacteria as Plant Pathogens". Annual Review of Microbiology. Cornell University. 2: 389–412. doi:10.1146/annurev.mi.02.100148.002133. PMID 18104350. ^ Jackson RW (editor). (2009). Plant Pathogenic Bacteria: Genomics and Molecular Biology. Caister Academic Press. ISBN 978-1-904455-37-0. ^ Agrios, George N. (1972). Plant Pathology (3rd ed.). Academic Press. ^ Isleib, Jim (19 December 2012). "Signs and symptoms of plant disease: Is it fungal, viral or bacterial?". Michigan State University. Retrieved 28 September 2016. ^ Kinealy, Christine (1994). This Great Calamity. Gill & Macmillan. pp. xv and passim. ISBN 978-0-7171-1881-6. ^ Dash, Mike (2001). Tulipomania: The Story of the World's Most Coveted Flower & the Extraordinary Passions It Aroused. Gollancz. This page was last edited on 14 March 2019, at 09:34 (UTC).